← What Does the Combo Port Mean for Your Network? Fiber optics is a technology that uses glass or plastic threads, namely fibers to transmit data. With its advantages over copper network, fiber optic lines have revolutionized long-distance phone calls, cable TV and the Internet. However, to many newbies of this industry or amateur of fiber optics, there are many terminologies that should be known before their learning journey. These terminologies are complicated and even dull which are hard to remember or understand. Don’t worry. Just reading this paper, you may find that it’s more easier to remember those complicated fiber optic terminologies than you think. Now, let’s begin with fibers. Multimode fiber: has a bigger core (almost always 62.5 microns – a micron is one one-millionth of a meter – but sometimes 50 microns) and is used with LED sources at wavelengths of 850 and 1300 nm for short distance, lower speed networks like LANs (Local Area Networks). Single-mode fiber: has a much smaller core, only about 9 microns, and is used for telephony and CATV (Cable TV) with laser sources at 1300 and 1550 nm. It can go very long distances at very high speeds but with higher cost. 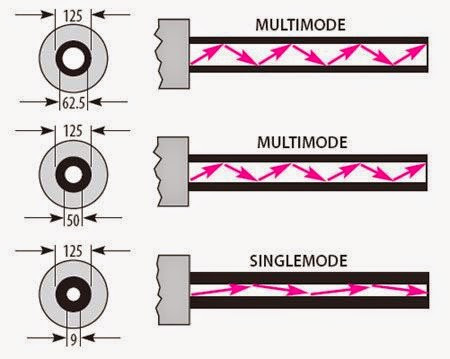 Note: Both multimode and singlemode fiber have an outside diameter of 125 microns – about 5 thousandths of an inch – just slightly larger than a human hair. Plastic optical fiber (POF): POF is a large core (about 1mm) multimode fiber that can be used for short, low speed networks. Cable: Cables have from one to hundreds of fibers inside. Because we rarely use the bare fibers in reality. Fibers needs protection to survive all the places it gets installed and it’s the cable that provides it. Jacket: A protective outer covering of cable. Depending on the intended use for the cable and the operational environment, it may protect against moisture, abrasion, magnetic fields, radiation, and so on. Some cables have more than one jacket which is also called cable sheath. Jacket materials can be various, such as PVC, LSZH, plenum (OFNP) etc. Strength Members: A strength member is an added component to a jacketed cable to help preserve the integrity and prevent separation in the mated ferrules. In most instances it is Kevlar Aramid Yarn, but can also be a flexible, but stiff fiberglass rod that runs the length of the cable. Armor: A protective covering of cables that is used to discourage rodents from chewing through it. LSZH: Low smoke zero halogen, is a material classification typically used for cable jacketing in the wire and cable industry. OFNP Cables: OFNP stands for Optical Fiber Nonconductive Plenum. OFNP cables have fire-resistance and low smoke production characteristics. They can be installed in ducts, plenums and other spaces used for building airflow. This is the highest fire rating fiber cable and no other cable types can be used as substitutes. OFNR Cables: OFNR stands for Optical Fiber Nonconductive Riser. OFNR cables are used in Riser areas which are building vertical shafts or runs from one floor to another floor. OFNR cables can not be installed in plenum areas since they do not have the required fire and smoking rating as Plenum rated cables. OFNP plenum cables can be used as substitutes for OFNR cables. Fiber termination is an important part of fiber optic cabling. The following terms you should know in this part of work. Jacket Slitter or Stripper: A stripper for removing the heavy outside jacket of cables. Fiber Stripper: A precise stripper used to remove the buffer coating from the fiber for termination, connectorization or splicing. Cleaver: A tool that precisely “breaks” the fiber to produce a flat end for connectorization or splicing when polishing is NOT required. Scribe: A hard, sharp tool that scratches and cleaves the fiber as it exits the tip of the connector user to sever or break the fiber prior to polishing. Polishing Film: Fine grit film used to polish the end of the connector ferrule and the fiber endface. Fusion Splicer: Also called fusion splicing machine, an instrument that splices fibers by fusing or welding them, typically by electrical arc. Cleaner: A professional cleaning kit for optical fiber ends and connectors, which can do great help in reducing light signal return loss. Optical Power Meter: An instrument that measures optical power from the end of a fiber. 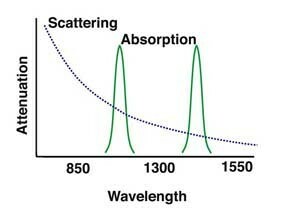 Optical Light Source: An instrument that uses a laser or LED to send an optical signal into fiber for testing loss of the fiber. 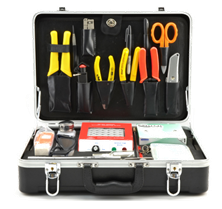 Optical Loss Test Set (OLTS): A measurement instrument for optical loss that includes both a meter and source. 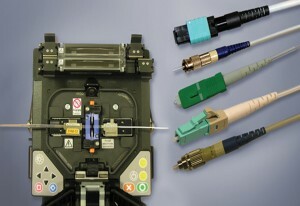 Loopback: short, single fiber cables with connectors on both ends, used to test unknown cables. Fiber Identifiers & Talk Set: It is essential installation and maintenance instrument in data networks, CATV and telecommunication networks. Fiber identifier can identify the optical fiber by detecting the optical signals transmitted through the cables. Talk Set combines in one set the functions of both a digital optical phone and a stabilized light source. It is usually used in pairs, and can work over 80km. OTDR: An instrument that uses backscattered light to find faults in optical fiber and infer loss from only one end of the cable. It may not include entire terms, welcome friends to add more about this. This entry was posted in Fiber Cable Assemblies and tagged fiber optic, fiber optic cable, fiber optic testers, fiber optic tools, fiber performance, fiber termination. Bookmark the permalink.